The holidays are all about traditions, and in my family, all the traditions are food related–something I alternately love and embrace and also something I feel I have to defend, for example, to boyfriends whose families are a little more “normal.” See, I wasn’t allowed to believe in Santa Clause–ever. From the moment I could remember anything, I just knew that Santa wasn’t real simply because I was told he wasn’t’. The presents under the tree were always from mom or dad, or, if my mom was feeling funny, from one of the cats. I never missed believing in Santa Clause–after all, he’s just some creepy old guy in a mothball smelling suit–but it’s a weird thing to try to explain to someone. As for our own traditions, like I said, they revolve around food–Jesus’ birthday cake, Christmas cookies, Christmas brunch, etc. I think I tried to make a gingerbread house once, but it didn’t turn out too well and I quickly lost interest in that normal tradition. We also didn’t really decorate Christmas cookies. My mom made a the spritz kind and maybe one or two others, but it was always a simple and delicious affair. After all, she had clients to take care of (she was a caterer). The main thing for us was definitely Jesus’ birthday cake (a towering dark chocolate layer cake affair with amaretto cheesecake between cake layers) and Christmas brunch–quiche lorraine, chocolate cream cheese Danish braids, sausage cheese balls, fruit, and sometimes cream puffs. Brunch rocked my socks. So now that I’m out on my own, I have to come up with some of my own traditions, and this process has translated into me just baking more, I think. Right now I have peanut butter balls cooling, rum balls in the works, hot chocolate mix galore, lists of other goodies to make–it’s a little ridiculous for one person. But it’s what I love. These chocolate chip bars are my mom’s recipe. You probably have one like it, but in our house these were constantly around. For any of the lunches she catered, my mom always had a tray of these, simply because everyone loved the buttery, chocolatey goodness of them, and also because they’re just so simple to make. You can whip these up in the time it takes to make biscuits–which for me isn’t too long, given my love affair with the latter. If you’re looking for a quick and easy holiday (or any day) treat, these might just do the trick! Using a pastry cutter, cut the cold Earth Balance into the flour mixture until it resembles coarse meal. Fold in the chocolate chips with a spatula, then pat into a 9×13 baking pan and squish flat to fill the pan. Bake for 20-25 minutes, until golden on top. Let cool for 5 minutes, then cut into squares. Let cool for another 30 minutes before serving. i fo ‘sho remember christmas cookies and christmas brunch the most from my childhood. my mom would make this egg-sausage-bacon-cheese-and-everything-else-that-might-kill-ya casserole and we always had fresh pineapple, ham, & chocolate pudding pie…. yesterday i had the day off from work & totally made my grandmother’s peanut butter balls, and i may have to make Hannah’s pecan pie balls, and rum balls you say?! mmmmmmm! 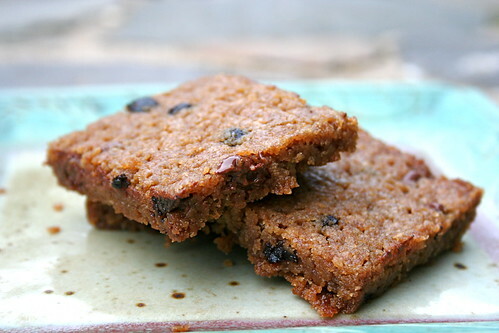 jesus cake sounds awesome, and i don’t have a chocolate chip bar recipe – but i do now. thanks for sharing, Jes. superw00t! wow, so simple! sound like the perfect crowd-pleaser! thanks! i loved reading about your family traditions. those look great and easy. It has been non stop cookie action at my house too! Yum! Those chocolate chip bars look awesome! and it seems like a simple enough recipe for even me to give it a try. Thanks for the recipe! WOW! These look awesome. They look chewy and moist and dense, all of my favorite things. Thanks for the recipe, it is simple and delicious, can’t wait to try it. A creepy old guy in a mothball smelling suit that likes to give little kids presents would be a perfect candidate for “To catch a predator” nowadays, wouldn’t he? Thank you for the recipe! Only five ingredients, and so easy! Have fun with all the baking! I have been craving chocolate chip cookies or something of their ilk. I think this may do the trick. I love this quick and easy recipe. Sometimes chocolate gets left out of Christmas baking and it’s my favorite!